From thought experiments to Agent Based Models and calibration. Reflecting (on) the many facets of simulations in economics. Editors of special issue: Muriel Dal Pont Legrand (Université Nice Sophia Antipolis), John Davis (Marquette University and University of Amsterdam), Magda Fontana (Università di Torino), Cyril Hédoin (Université de Reims – Champagne-Ardenne), Alan Kirman (EHESS). Expression of interest: July 30th 2018. Notification by the editors: August 30th 2018. Deadline for submission of revised papers: May 30th 2019. Planned publication of the issue: March 2020. 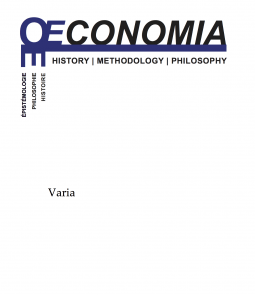 Simulation as a method of investigation or of validation in economics has been used steadily although with parsimony since the second half of the 20thcentury. Perhaps it would be more correct to say that simulation methods have been confined to the work done by economists that has never come to the foreground and rarely been debated, in contrast to the extensive literature on the use of experimental methods in economics. However, there is now a growing awareness that a body of practices in economics can be grouped together under the heading of simulation methods, and shares a number of specific goals within economics as a whole. Historians of economic thought still largely ignore this territory (Colander (ed. ), 2000; Fontaine and Leonard (eds), 2005) and it is only over the last decade that there has been a growing interest in methodological and epistemological issues linked with simulation proper (e.g. Reiss, 2011; Fontana, 2006; Grüne-Yanoff & Weirich, 2010). Recent advances in the use of Agent-Based Models in economics, as well as continuous developments of technologies and transformations in the representations of economic practices, make simulation an ever more attracting or even a necessary step in theoretical and applied work in economics. The time is ripe for reflecting on the recent and older trends pushing forward simulation in economics, discussing and confronting their contexts of development and purposes, and elaborating on the various kinds of epistemological or methodological stances that account for their proper use in economics and other social sciences. Œconomia intends to publish a special issue covering the various historical and epistemological aspects of simulation. The remainder of this call provides an overview of the different directions of research that may be usefully investigated regarding simulation in economics. It then provides a short (non-exclusive) list of possible themes of investigation and gives some practical information about the schedule of the special issue.